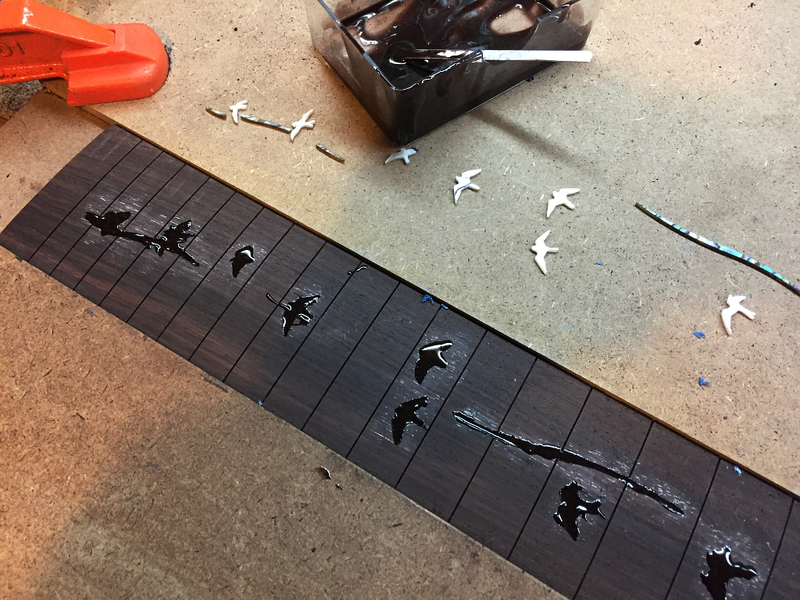 First step in doing the inlays is covering the board with masking tape, and making grooves over the fret slots. 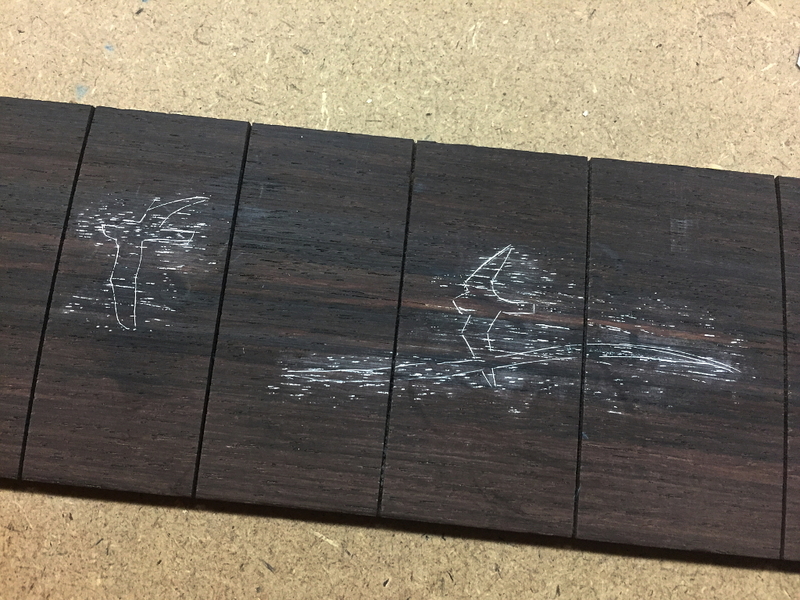 Then I place the board in my little jig for routing inlays. 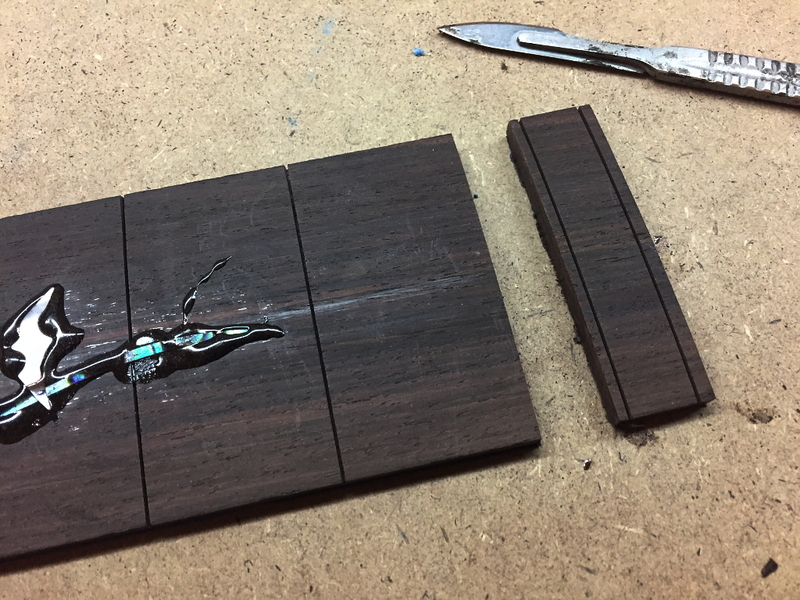 Calling it a “jig” is giving it a lot of credit. 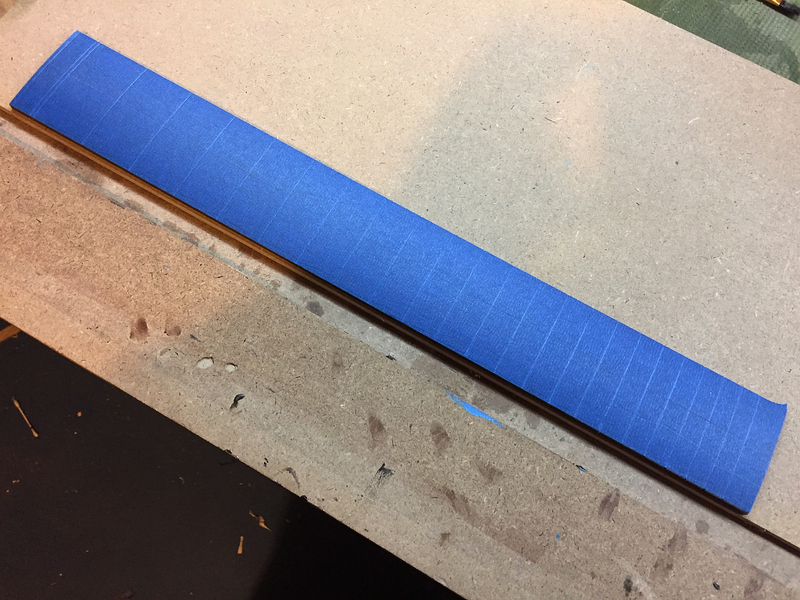 Its just two pieces of 1/4″ thick MDF. 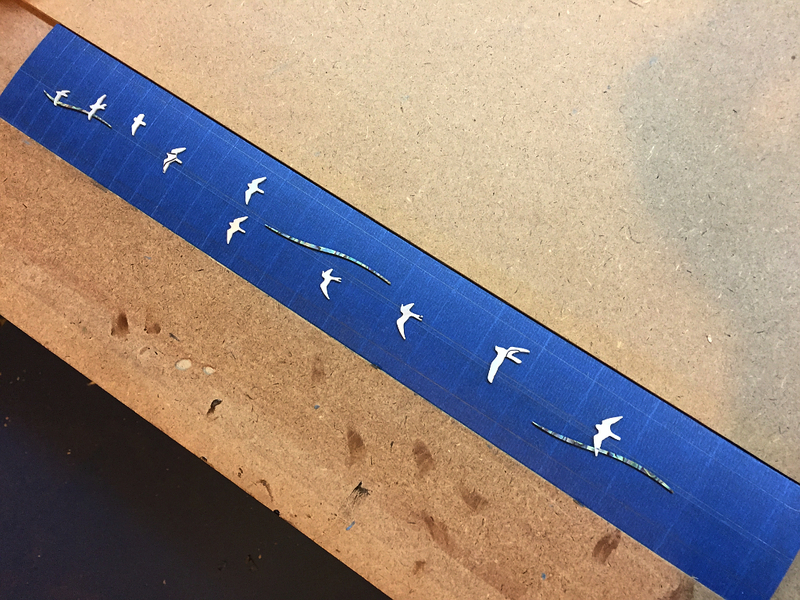 It gives me a flat surface to sit the dremel base on so I can route flat bottomed cavities for the pearl pieces. 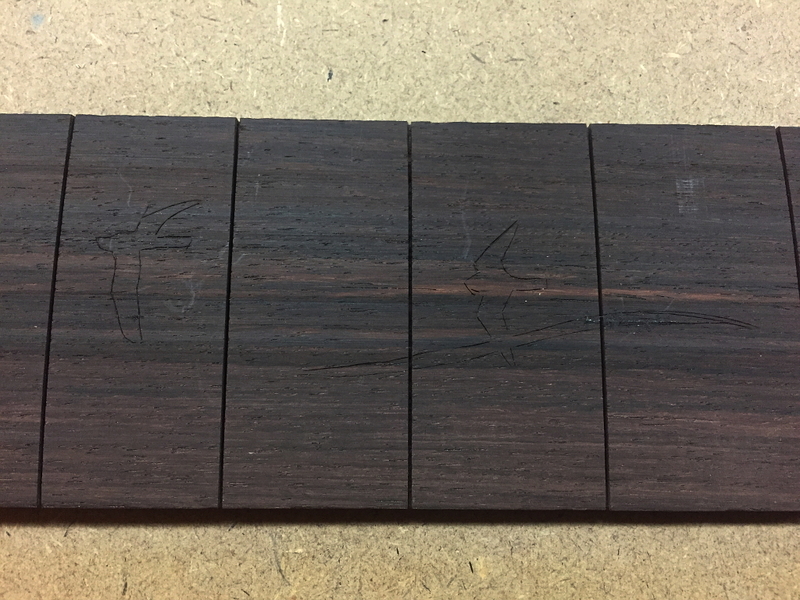 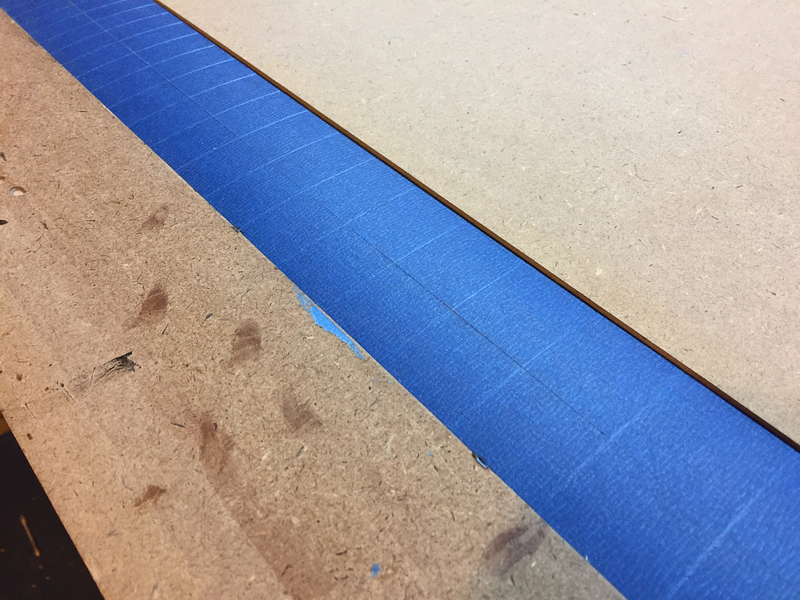 Then I need to mark out the exact centerline of the board, as well as where the edges of the fretboard will be once its cut to fit. 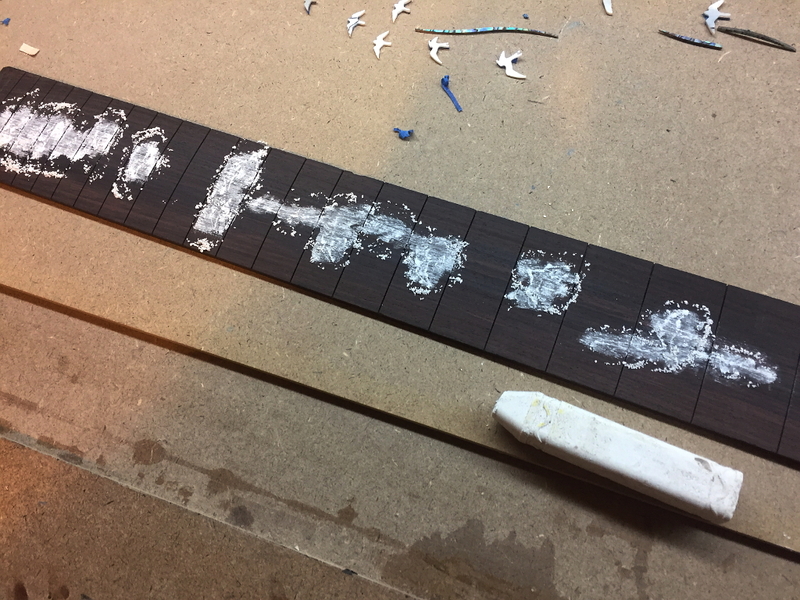 After that its a matter of getting all the pieces placed exactly where I want them and gluing them down with a small amount of CA glue to hold them in place. 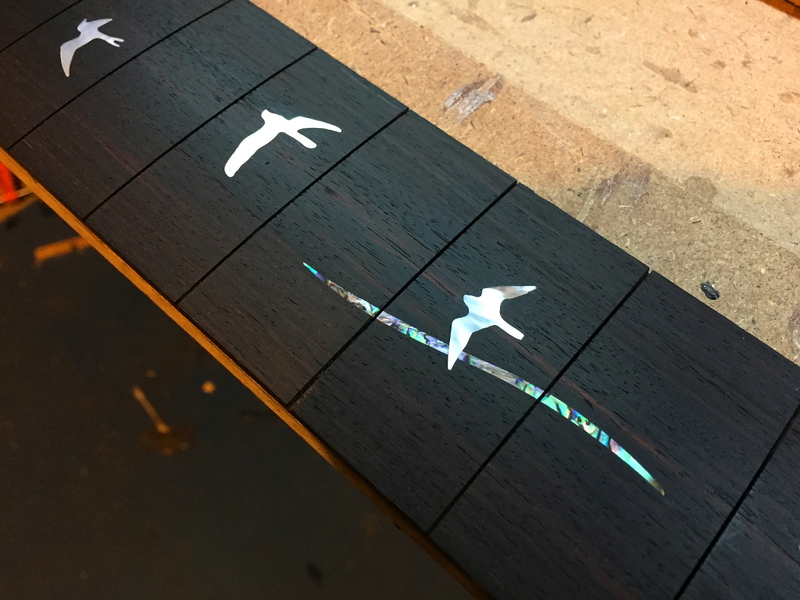 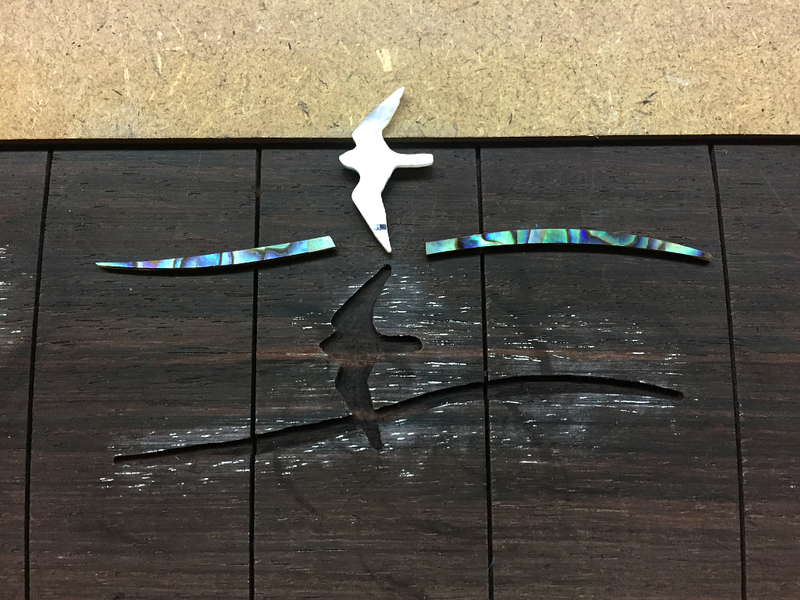 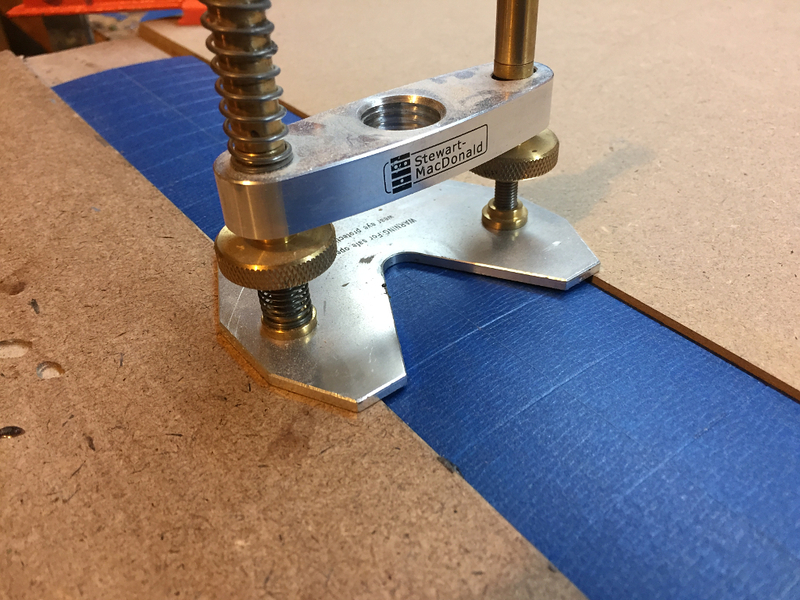 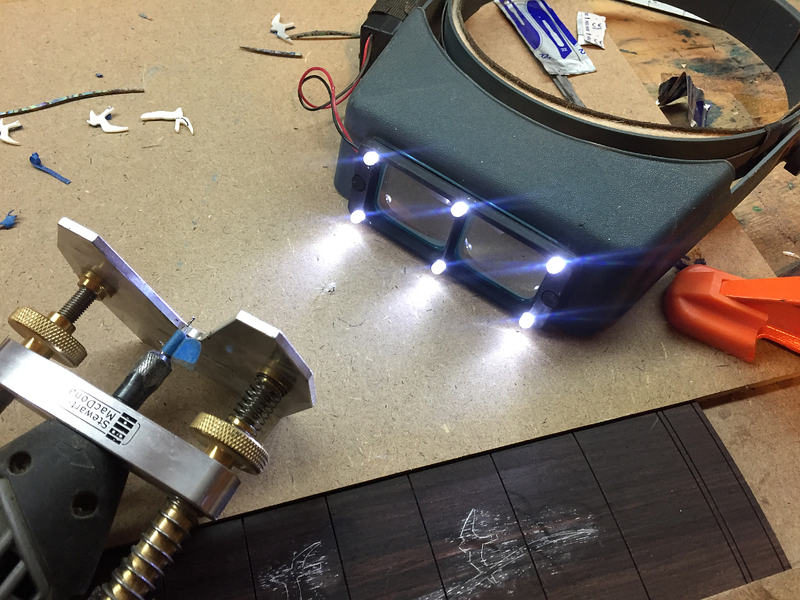 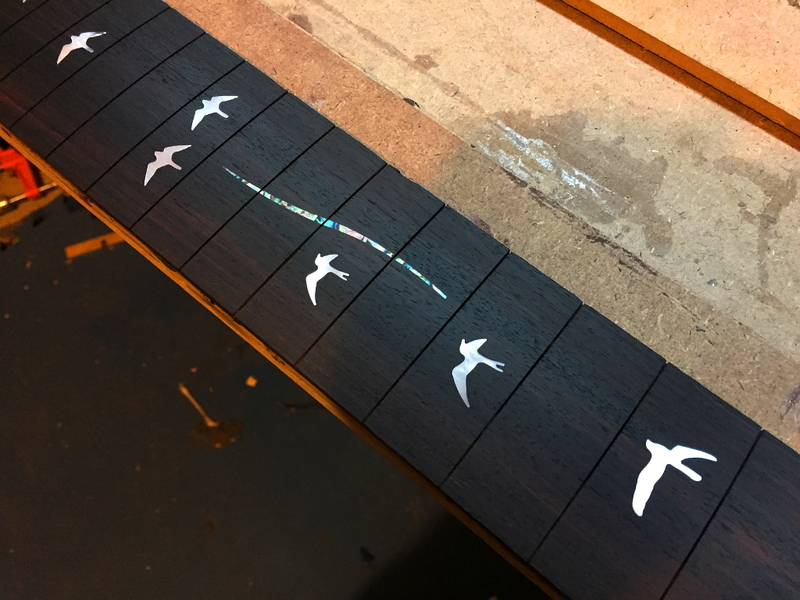 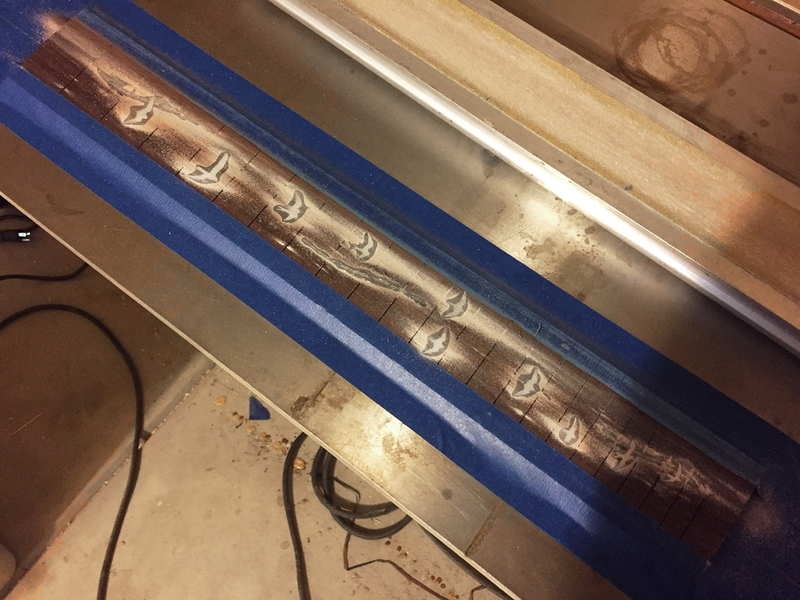 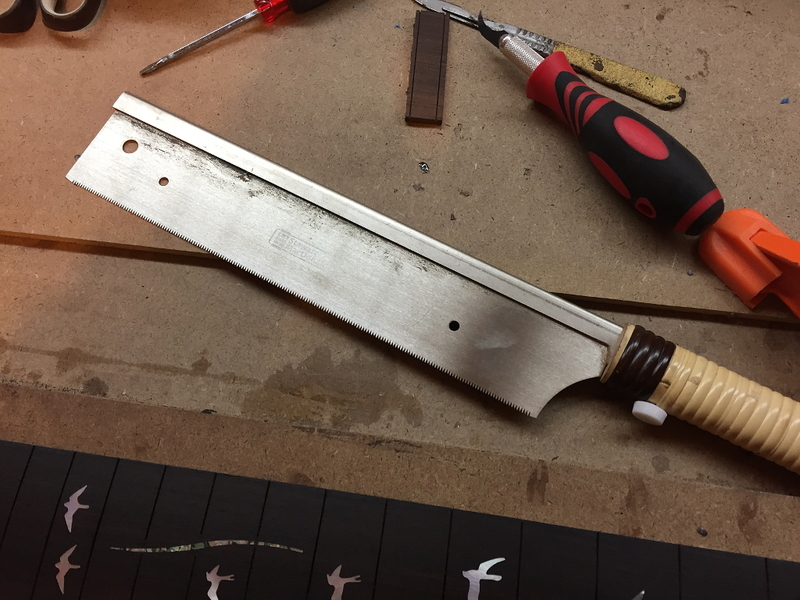 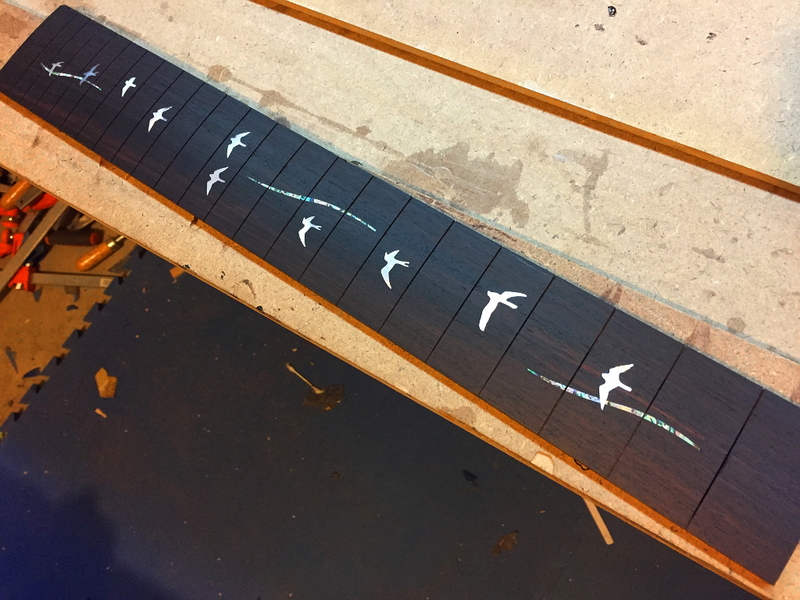 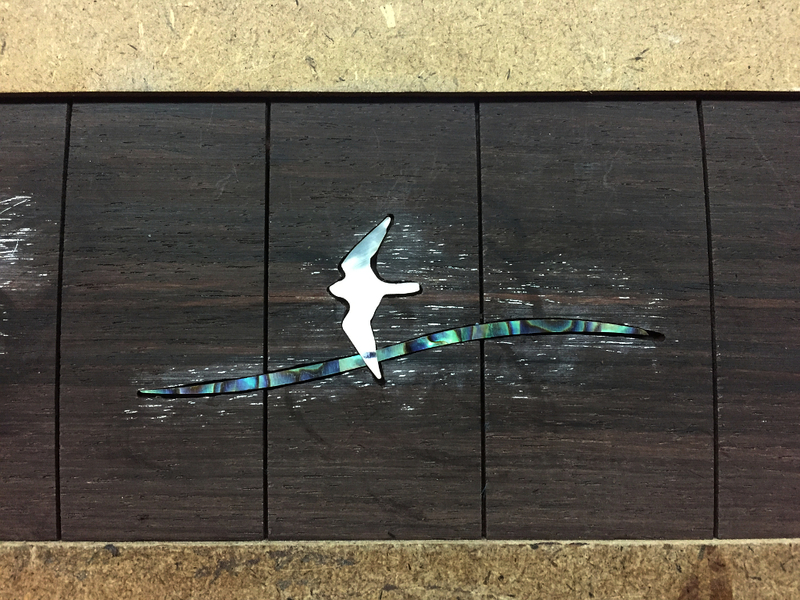 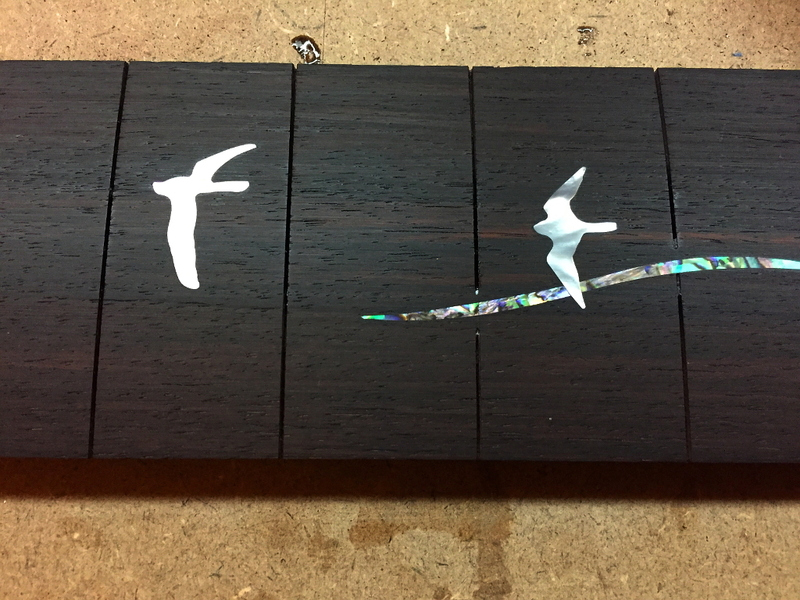 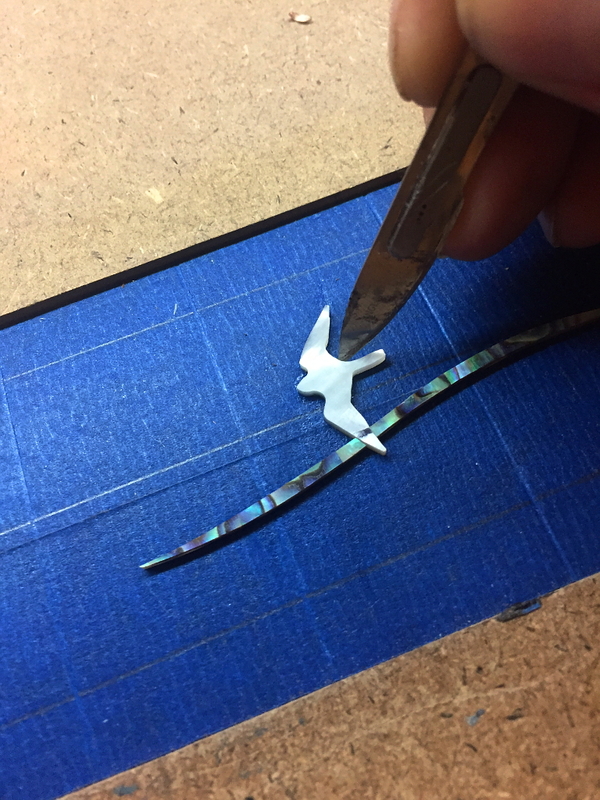 Once the glue is set, I cut around the inlays with a scalpel…. 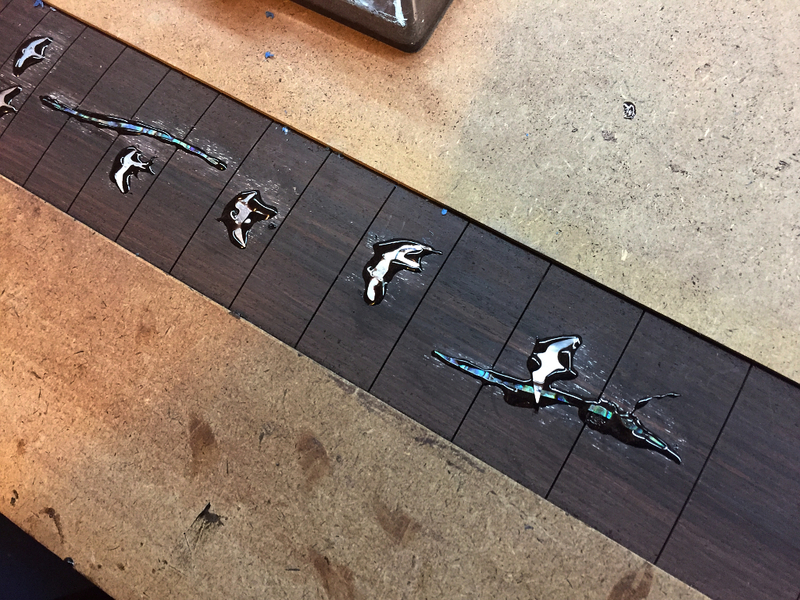 I then push the inlays into the epoxy. 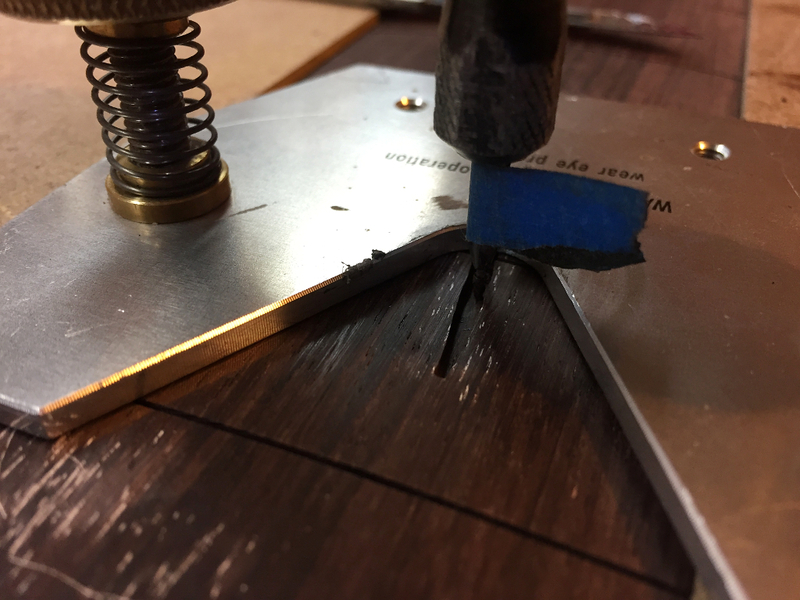 the reason I use so much in the cavities is because when the excess squeezes out around the inlays, it completely fills the gaps around the edges of the inlays. 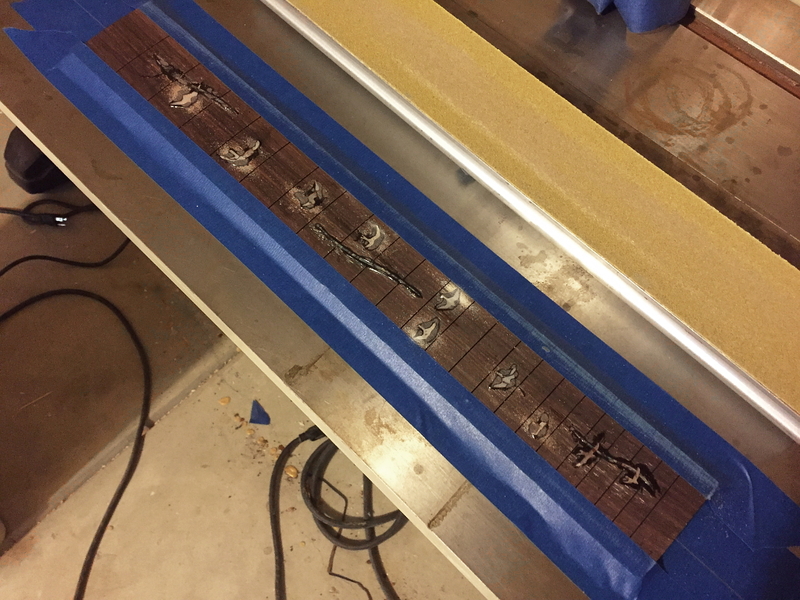 OK first, since this guitar gets a Floyd Rose tremolo with a locking nut, the end of the fretboard and slot that normally holds the nut can be removed…. 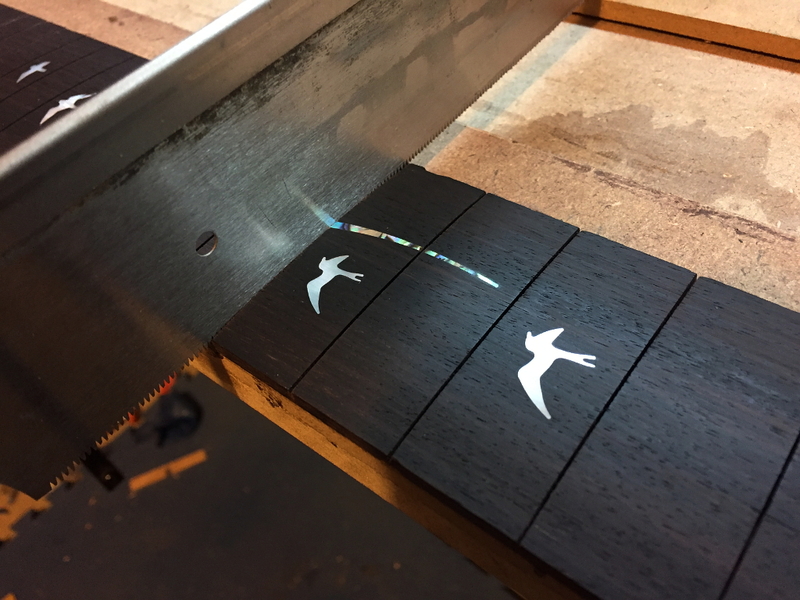 Then I attach the board to my table saw and use my radius beam to sand the inlays flush. 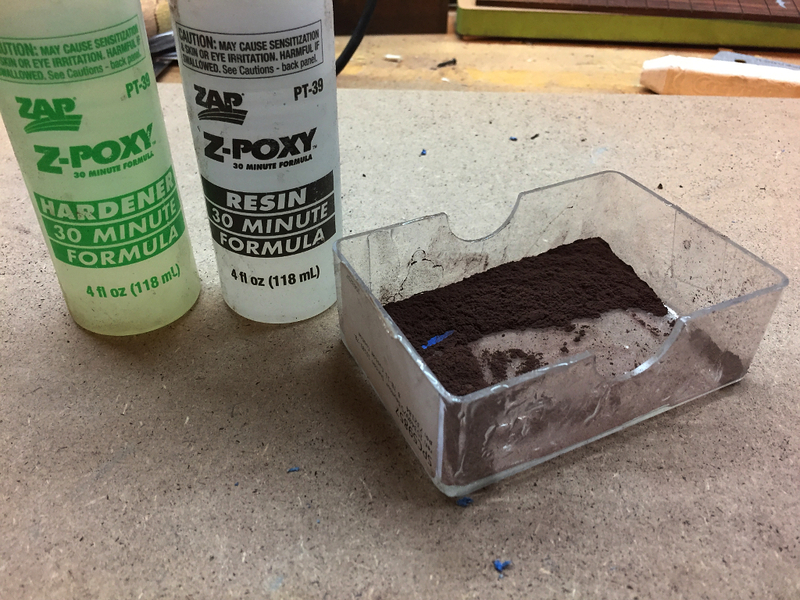 I start with 80 grit to take down the bulk of it, then as I get closer to the surface I switch to 120, then 180, and finally 220 grit. 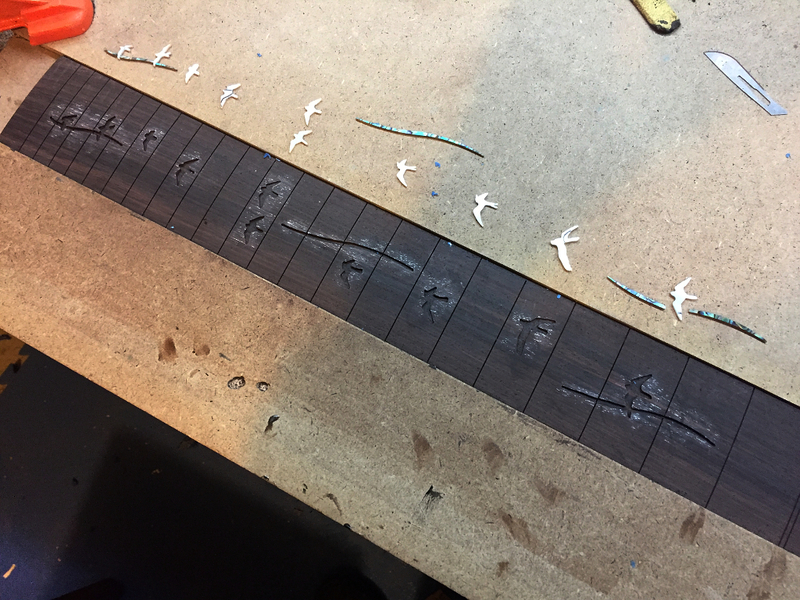 You’ll note here that some of the shell pieces cross the fret slots and also some epoxy from gluing the inlays in place has invaded the slots as well. 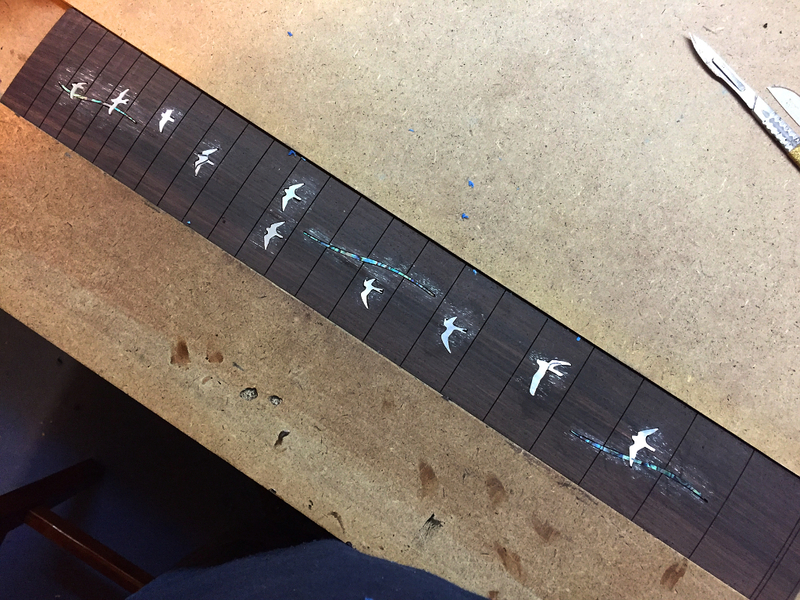 Obviously this will make it impossible to install frets.